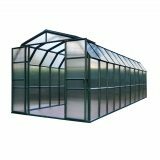 The Grand Gardener range is manufactured in Israel from extruded dark green UV stabilised Resin, the thick frame has natural insulating qualities in an attractive barn shape style. 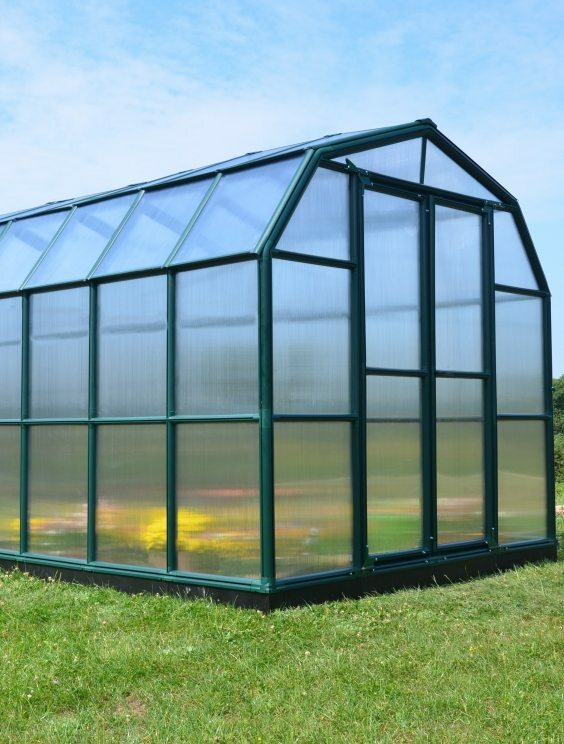 The twin-wall 6mm opaque polycarbonate glazing panels create superb insulation, are lightweight and defuse over 90% of the dangerous UV light, so provides perfect protection for your plants and flowers. NOTE: dimensions may be understated, please contact us for exact measurements if required. 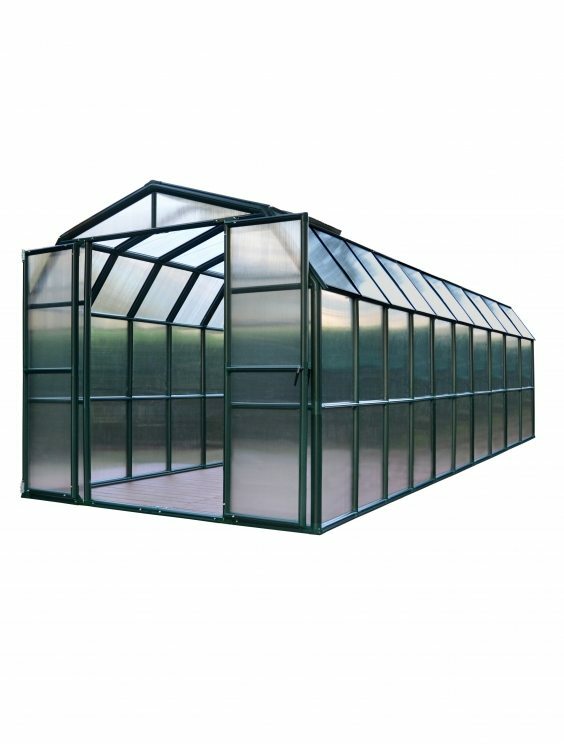 The Eden Grand Gardener Opaque AB63GO is a spacious premium greenhouse with excellent features for the gardener. Its barn shape design provides large headroom for work comfort. 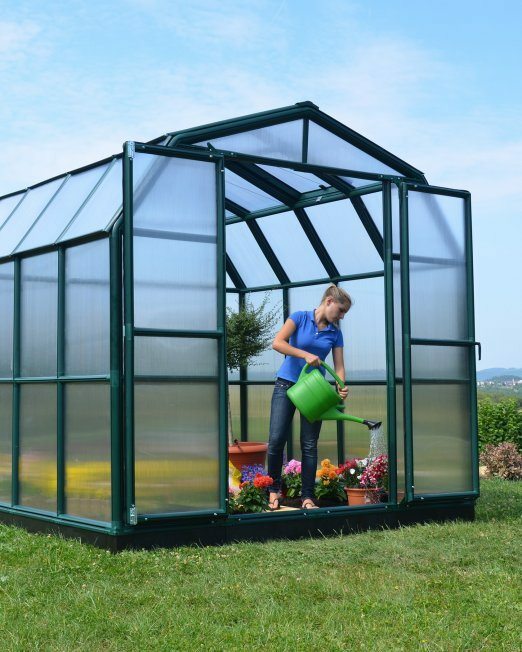 It comes with a durable green resin PVC frame and virtually unbreakable twin-wall glazing. These both contribute to outstanding insulation and create a unique nurturing environment. 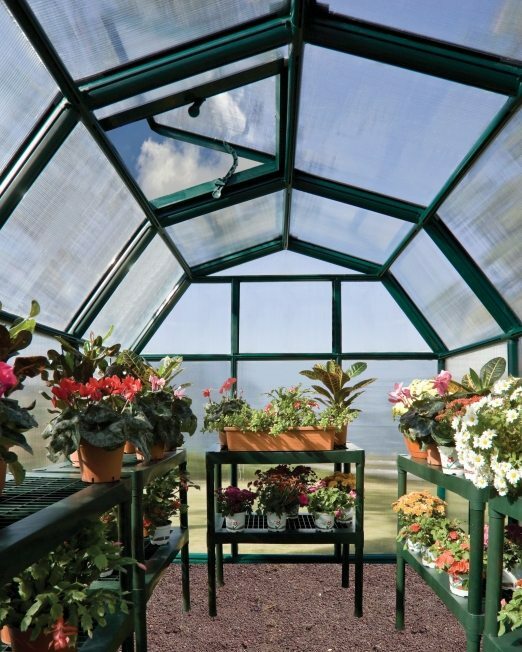 The greenhouses’ twin-wall glazing diffuses direct sunlight and also helps retain maximum heat on cold days. 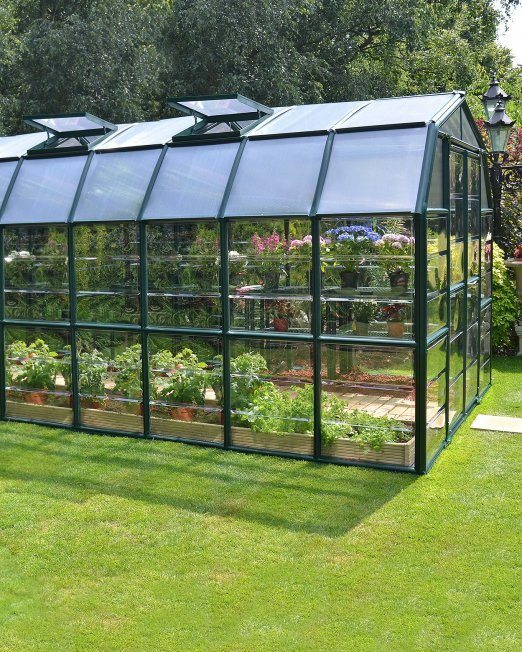 The robust frame easily snaps together using smart ‘Pin & lock’ connectors and enables the structure to withstand extreme weather conditions for many years of gardening use. It is also easily extendable with the addition of extra centre modules. Made in Israel with a 10 year warranty, this range is manufactured from extruded dark green UV stabilised resin with a twin wall polycarbonate glazing. Double doors with a latch and one roof vent are also included. – Easy Pin & Lock connectors assembly – no special tools required, easy to DIY! 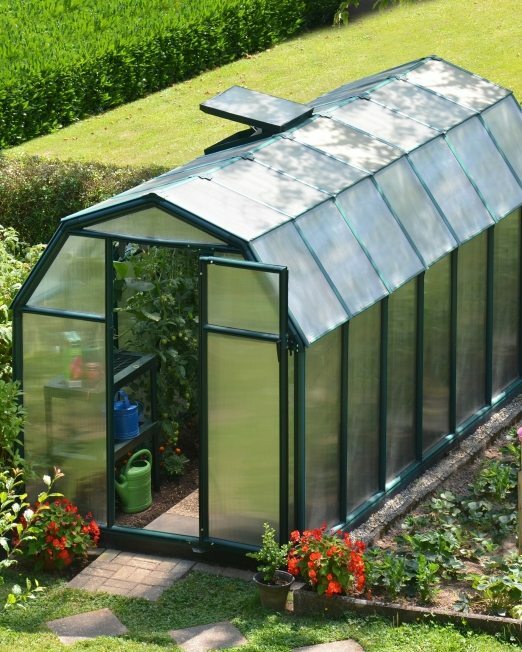 The barn shape roof design ensures great headroom and large gardening space together with roof vents that provides the vital ventilation your plant’s needs. 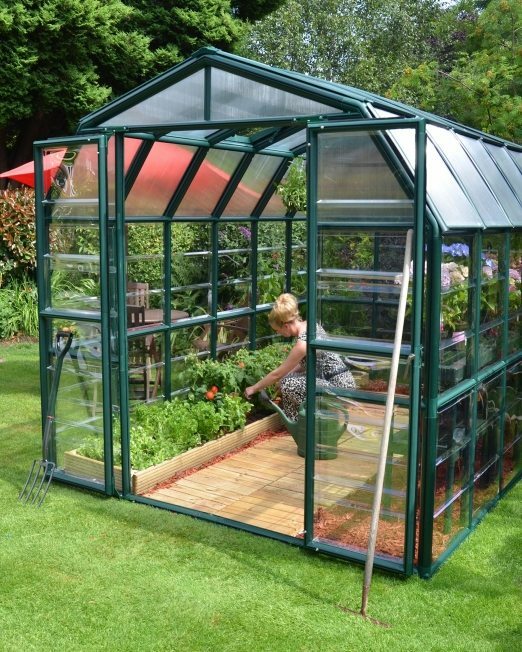 The Grand Gardener is the perfect solution for growers wishing to extend their garden. 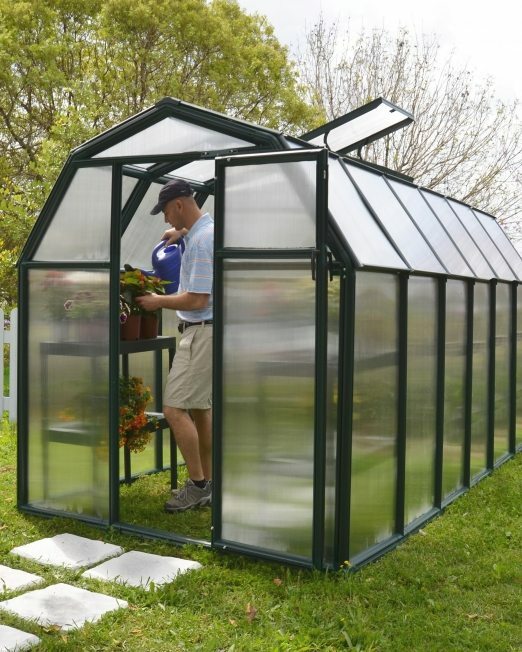 It can fit perfectly also to narrow as well as smaller yards or growing areas. 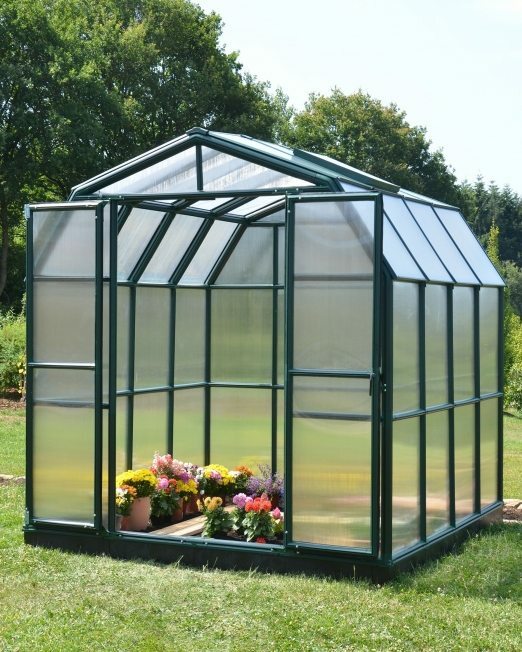 *Please note, you can erect the frame straight onto concrete or other foundation of your choice (needs to be a firm, level foundation so the greenhouse can be securely fastened into the ground). 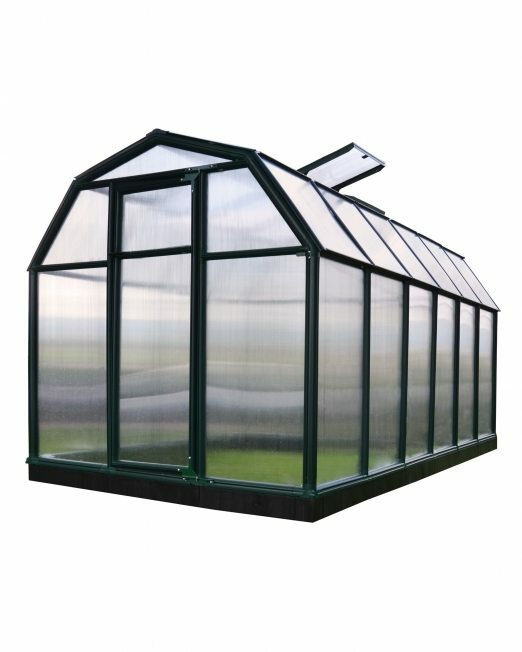 Click here to view the full greenhouse range. 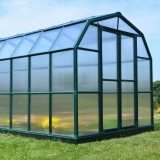 Add a shade cover kit to your glasshouse for extra protection for your garden. For proper ventilation, in hot summer areas you NEED TO SPECIFY DOORS BOTH ENDS, i.e. extra doors in lieu of rear wall. The AB63GO comes standard with 4 roof vents. In hot summer areas we recommend ordering 4 extra vents for proper ventilation (8 vents in total). Number of Extra Roof Vents ($149.00) This must be a number! Number of Auto Vent Openers ($98.00) This must be a number! The AB63GO comes standard with 1 wall louvre. Extras may be added if required. Number of Extra Wall Louvres ($149.00) This must be a number! Number of Auto Louvre Openers ($149.00) This must be a number!